These individual double apple tarts are easier to make than you might think. They have a base of vanillary apple puree and white chocolate which is then topped with apple slices and glazed with apple jelly. Perfect for picnics, dessert or afternoon tea. We had a wonderful time last week, jaunting off for an evening picnic with friends at Helligan Gardens followed by a production of Dead Dog in a Suitcase by the multi talented and much loved Kneehigh Theatre. I wanted something a little more elegant than my usual fare for such an occasion. We had a load of apples that needed using up, so I knew It had to come up with a recipe containing apples. After a little deliberation, I decided to make some apple tarts. Since I discovered the fabulous yogurt pastry I used for my rhubarb and almond cream pasty pie earlier this year, there’s been no looking back. It’s easy to make, easy to use, has a great taste and texture and doesn’t crack when rolling. When I make a dessert dough, I tend to add a little white chocolate to the pastry. This provides a note of sweetness and really helps with the texture too. I used about a third of the pastry for the tarts and used the rest in a roasted squash, runner bean, blue cheese and walnut tart which I also made for the picnic. As it happened, I was in a bit of a hurry and totally forgot to add the white chocolate to the pastry. So, I ended up adding the chocolate to the apple puree part of the tart instead. This worked brilliantly – sometimes mistakes are just meant to happen. The tarts looked good and tasted even better. The apple puree had a lovely creamy texture and vanilla flavour due to the white chocolate, which contrasted well with the crisp unsweetened pastry and the apple slices on top. Thanks for visiting Tin and Thyme. If you make this recipe for double apple tarts I’d love to hear about it in the comments below or via social media. Do share photos on your preferred social media site and use the hashtag #tinandthyme, so I can spot them. For more delicious and nutritious recipes, follow me on Twitter, Facebook, Instagram or Pinterest. White Chocolate Apple Tarts. PIN IT. Individual apple tarts with a base of vanillary apple puree and white chocolate topped with apple slices and glazed with apple jelly. Perfect for picnics, dessert or afternoon tea. Rub the butter into the flour with the tips of your fingers until the mixture resembles breadcrumbs. Stir in the yogurt using a flat bladed knife until the mixture clumps together. Bring it together with your hands to form a ball. Cover with a tea towel or plastic bag and leave to rest for an hour before rolling. Roll the shortcrust as thin as possible and line six 10cm tart cases. Blind bake at 180℃ (350℉, Gas 4) for 10 mins. Peel, core and dice the windfall apples being sure to cut out any bad bits. Cook over low heat with a splash of water and the vanilla sugar for about 10 minutes or until soft. Remove from the heat and add the chocolate and nutmeg. Stir until the chocolate has dissolved and the apples are roughly pureed. Leave to cool a little. Divide the puree between the six tart cases, ensuring the pastry bottoms are all covered. Quarter and core the dessert apples, then slice thinly. Top the tarts with the apple slices, then sprinkle with a little vanilla sugar. Bake at 180℃ (350℉, Gas 4) for 15 minutes or until the apples are soft and slightly caramelised. Warm the apple jelly in a pan and brush over the hot apples. Leave the tarts to cool. I've given the recipe for my fabulous flaky yoghurt pastry, but you can use whatever shortcrust pastry you prefer. You will only need about ⅓ of the quantity to make six tart cases. Use the rest to make more tarts or something else altogether. It will keep for 3-4 days in the fridge if wrapped in plastic. September’s Four Seasons is all about getting fruity, so I am sending these double apple tarts off to Louisa at Extra Veg and Anneli at Delicieux. I love how you prepare the apple filling with white chocolate. These tarts look scrumptious, Choclette. Thank you Angie – it wasn’t my original intention, but it worked beautifully. These are gorgeous, love how you prepared these lovely tarts. Ooh these are so pretty. Love how thick with apple they are. The yoghurt pastry sounds great too. Thanks Dom, that pastry is fantastic and so easy to work with too – love it. Oh, and the tarts were tasty too. Love how much apple you’ve managed to pack in there – I do love a good apple tart; never seen apple paired with white chocolate before – I imagine it’s delish! 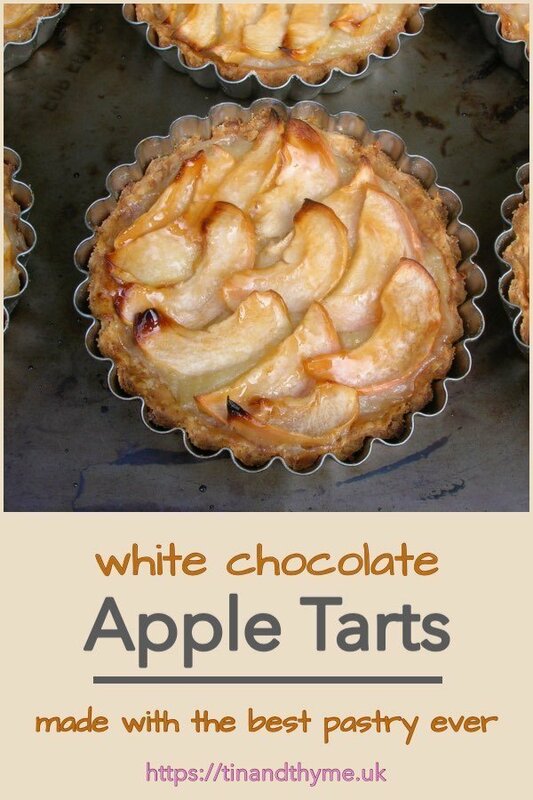 These are definitely appley tarts CC and the white chocolate works wonders in the puree. Beautiful tarts. I’d never have thought of combining white choc with apples. I can see the vanilla flavour would taste great though. I love it when mistakes can produce the best results. gorgeous recipe Choclette. Bookmarking and pinning it. Great- another lovely recipe to use up all to use abundant apples I find myself with. What divine tarts! Both of them!! The shine on the apples from the apple jelly makes them look so inviting and adds to their beautifulness. 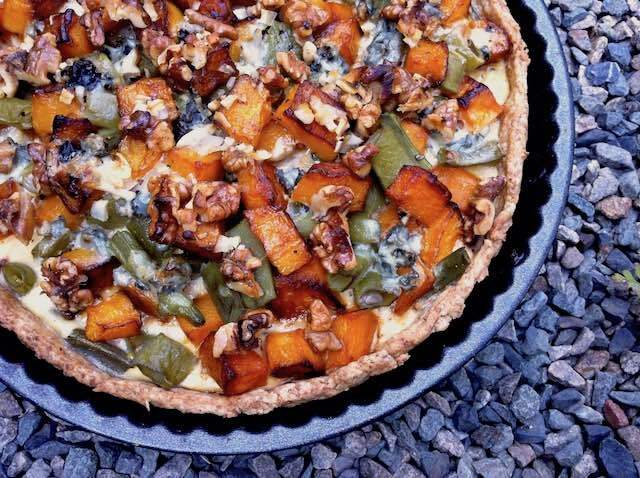 The flavours in the savoury tart sound wonderful too….. I’ve just harvested a few squashes, so may just have to try this! Ah, thank you Kate, you always say such nice things. The squash tart was scrumptious and I think I might have to make another one soon. White chocolate, I’ve found, works well in so many things. Ooh I hope you try them out Alida. Yours will look super if you make them and I’m sure you’ll give them a meraviglioso Italian Twist. Gosh what a lovely pairing of apples with white chocolate and your tarts look as pretty as a picture! Yogurt pastry is a new one to me, but something I’m now eager to try. My huge apologies Choclette for only getting around to reading your post now, it’s been a very hectic couple of months here! Thanks so much for linking your lovely recipe up to September’s Four Seasons Food ‘Getting Fruity’ challenge. Ah well, that makes two of us Lou, I’ve only just spotted your comment, thank you. I’m thrilled with the yogurt pastry. Give it a try and let me know what you think.